One of the sad things that happens to fine varieties of orchids is they sometimes become victims of changing fashions in the orchid world. As fashions change, the plants temporarily lose their value and importance and are often thrown away. If a clone is truly rare and only one or two plants exist in cultivation this can be a disaster. If the plant was a species, it could represent the best nature developed in a thousand years. If a hybrid, it could be the product of many generations of breeding by a skilled hybridizer. Either way, it is a great loss. When I was 17 years old and learning to grow orchids from the old estate growers in and around Elkins Park, Pennsylvania, Charles Davis, the grower for Wharton Sinkler handed me a plant of Cattleya lueddemanniana one afternoon and said, “I want you to take this and grow it and see nothing happens to it.” He told me he was concerned that orchid growers were now throwing out their fine old cattleya species because the big, round hybrids were all the rage, and he felt this plant was too good to lose. 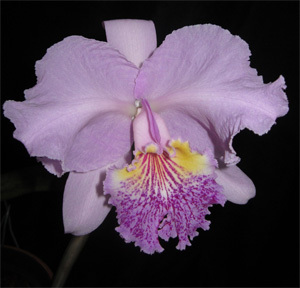 Even Sinkler, he said, had been bitten by the hybrid bug and no one else had this C. lueddemanniana. The plant had turned up in an importation from Venezuela of jungle-collected Cattleya mossiae and C. lueddemanniana by Brighton Farms in Linwood, New Jersey in the early 1930s. When Brighton saw how outstanding the flowers were, they brought it in flower to Wharton Sinkler. Sinkler paid $35 for the plant which was a handsome sum in the midst of the Great Depression and he considered it a bargain. Sinkler had a large collection of fine cattleya species at the time, and this was the best C. lueddemanniana Davis had ever seen. Well, I took the plant and gave my sacred oath. I would see that it did not become a victim of the hybrid craze. That was in 1947. By 1954 the plant had managed to survive my 5 years in college and graduate school and my 2 years in the Air Force during the Korean War thanks to my parents who still maintained my 30-foot greenhouse and all the plants in it. But, now a new crisis loomed and my greenhouse had to be taken down and the collection sold. I had taken a job with a big chemical company and would be living in Texas, which was a long way from Elkins Park, and big companies had a bad habit of transferring young salesmen all over the country and sometimes even overseas. My parents did not want to inherit my orchids indefinitely with all the work that entailed. Seven years had already been a lot to ask. So I sold my orchid collection to a large commercial grower and the greenhouse was torn down. The grower’s truck came and picked up the plants and that was that. One plant, however, did not go with the commercial grower – Sinkler’s C. lueddemanniana. I’m not sure I know the value of a 17 year old’s sacred oath when the chips are really down. It never worked too well with girlfriends, but, I remember asking my father , “Can you take care of this until I can build a new greenhouse?” and handed him the C. lueddemanniana plant. He nodded and put it under his arm. “Can it grow in the kitchen window?” he asked. “It will have to like it” he replied. If my father had refused, I guess I would have taken the plant to Dallas to an unknown fate - and my second floor apartment didn’t even have a kitchen window. It was 5 years before I was able to rescue the plant from my father’s kitchen window. It didn’t flower during those years, but it didn’t die either. When I married and built a lean-to on my house which was now in Florida, my father and mother arrived with the plant as a house-warming present. When the plant finally recovered enough strength to bloom again, I exhibited it even though it had a relatively poor flowering, so I could thank my father for keeping the plant alive. I named it ‘Arthur Chadwick’ after my father and it garnered an HCC/AOS. In 2002, a friend of mine, Anthony Alfieri, to whom I had given a division, exhibited it on a better flowering and received an AM. It is nice to see Sinkler’s Cattleya lueddemanniana survived the destructive changes that shook the orchid world when cattleya species went out of fashion and the hybrid era ran wild. Today, of course, it is the species that are worth more than the hybrids. As I look back, however, I feel there could have been a lot more wonderful species saved with a little more enlightenment. I guess at times it just takes a scared oath.